We offer a high standard of comfortable 4 star accommodation. 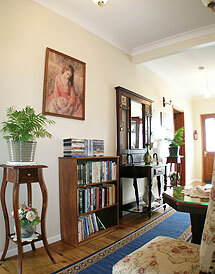 All our guest accommodation is located entirely seperate from the hosts. 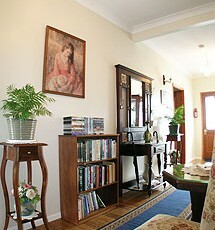 Experience the difference of the traditional style of B & B while enjoying the very best of modern, clean conveniences. Step back in time and enjoy the ambience and old fashioned decor. Relax on our front covered verandah and rear shaded deck and enjoy our wonderful sea breeze. All guests have remote control of our security gate. Our purpose built Dining Room and relaxing Lounge & Bar area offers our guests individual tables where we serve breakfast at any time between 7.30 and 8.30 am. (Earlier if especially requested). We also have regular corporate clientele who enjoy our home comforts.